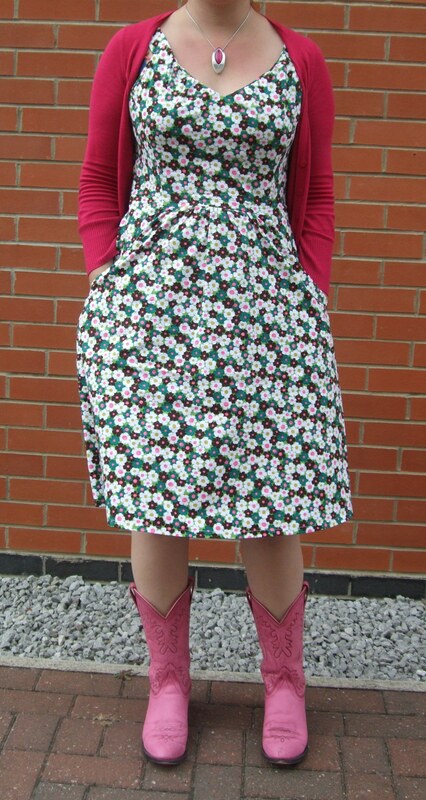 Day 15 – Simplicity 2591 in Michael Miller Marcia fabric, worn with my pink cowboy boots from America! Day 16 – Colette Parfait dress – this time worn in a hot, summery context with my faithful bronze Birkenstocks. Day 17 – Colette Crepe floral dress. This is a recently completed project and it was ready to wear in time for my shopping and dinner date with Julia! I made the facings out of the contrast fabric and so was able to squeeze the rest of the dress out of 2m remnant I picked up for £4. The fabric is 100% cotton sateen and feels really floaty. I underlined the dress like I did when I was following Gertie’s Crepe Dress Sewalong for my first dress. My sage green Bertie T-bar shoes go well with the dress. I’m wearing the skirt with my new pink court shoes from Clarks. 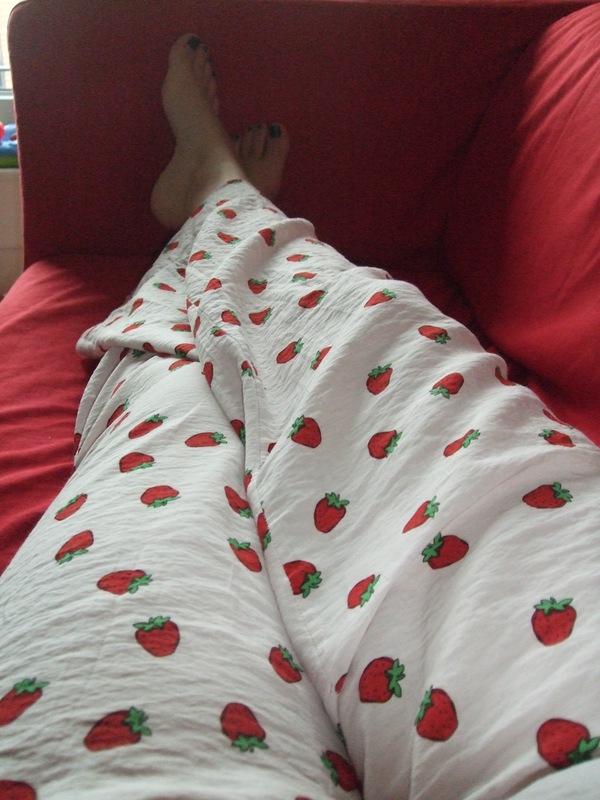 Day 19 – Simplicity 2317 Pyjama bottoms. I did not leave the house today! This shot was inspired by Tilly! Day 20 – S.E.W. Naughty Secretary skirt in Linton tweed. This is another recently completed project. It’s the third thing I’ve made from this book. Linton Tweed is the most expensive fabric I’ve ever used, but luckily Julia and I got a special deal at the Sewing for Pleasure show! I’m wearing it with a white blouse from Marks and Spencer and my Irregular Choice pale pink patent shoes. 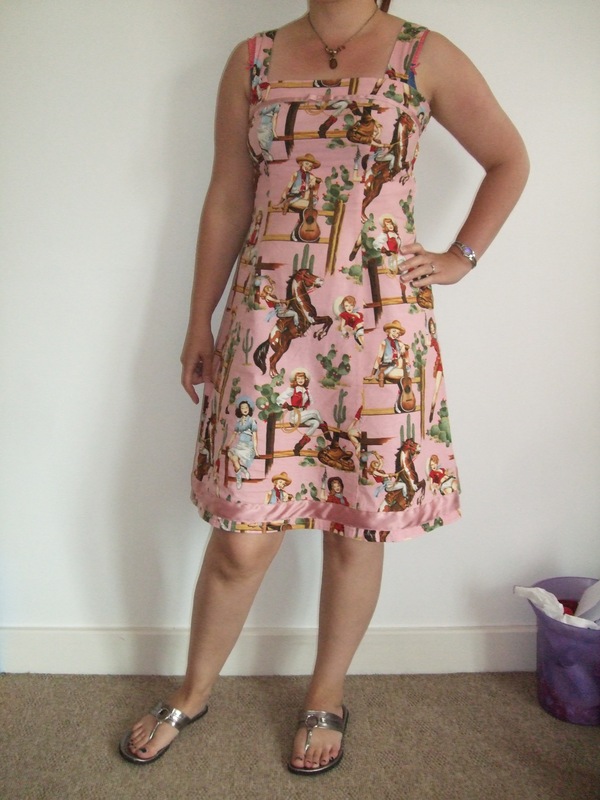 Day 21 – New Look 6789 in Alexander Henry Pin-Up cowgirls fabric. It was quite hot today so I’m wearing my Bertie flip flops. oooohhh! Love your outifits! The prints are great and they all look fantastic! Pink cowboy boots! So fun. I love that lovebird print, too. Thank you both! 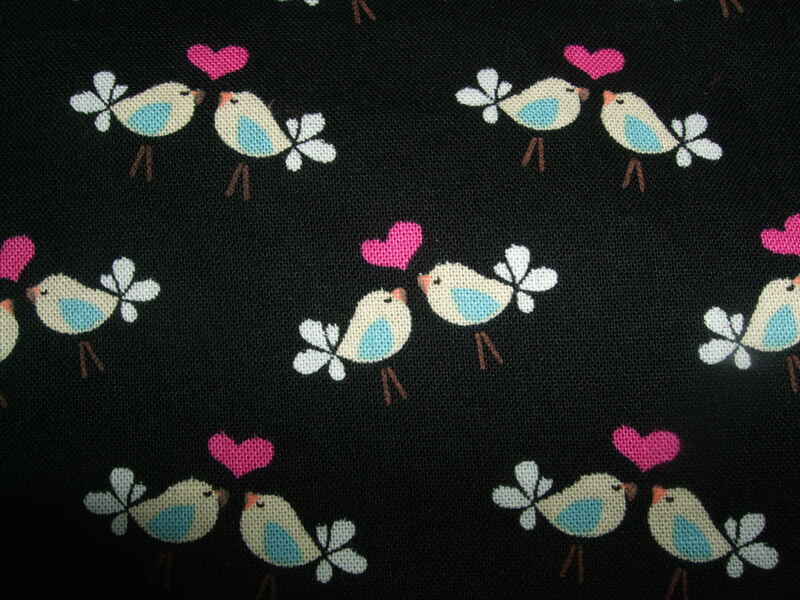 That Michael Miller Lovebirds fabric is so cute, I am glad to use it up for something so nice as the Crescent skirt. Re: pink cowboy boots: I often get strange looks when I wear those boots (and on one occasion some deeply unkind comments), but I’m trying to keep my confidence to wear them with pride! I know some people may find them ridiculous and over the top, but that doesn’t mean I shouldn’t wear them if I like them! It was great to mmet you too – so organised! You can come round and sort my sewing room out any time you want. In fact, please do! hope to meet you again sometime. It’ll be nice if there’s another Brighton meet-up, definitely!